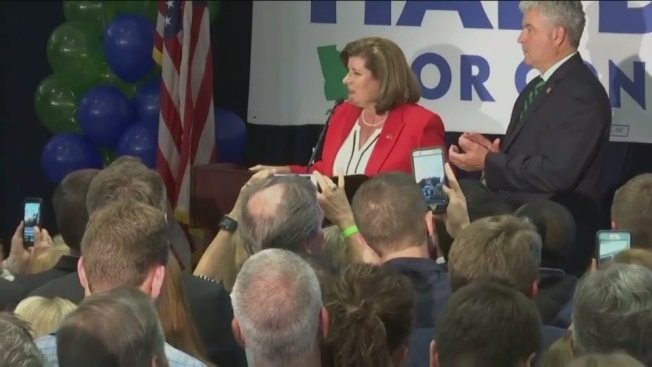 Republican Rep. Karen Handel has conceded her long-red House seat in the Atlanta suburbs to an African-American gun control advocate making her first run for public office. Handel's statement Thursday morning says her careful review of the vote count shows she narrowly lost to Democrat Lucy McBath. "It is clear that I came up a bit short," she said, offering McBath "good thoughts and much prayer for the journey that lies ahead for her." McBath's margin of victory was narrow enough for Handel to have requested a recount. NBC News hasn't declared a winner but, as of about 11 a.m. Thursday, McBath had about 3,000 more votes. 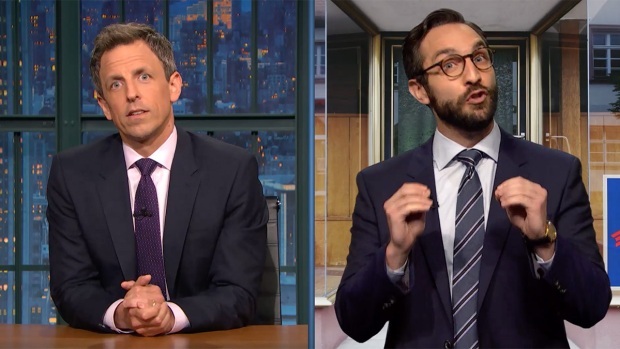 Seth Meyers tapes 'Late Night' early in the evening, so on Tuesday, he prepared for both outcomes of Georgia's special Congressional election: Democratic candidate Jon Ossoff winning and losing. Handel won this battleground district in a special election last year by beating Democrat Jon Ossoff in a race that set records for campaign spending. Newt Gingrich held the seat as when he led a GOP congressional takeover in mid-1990s and became House speaker. McBath campaigned as a "mother on a mission" to strengthen gun control laws. Her 17-year-old son, Jordan Davis, was fatally shot at a Florida gas station in 2012 by a white man who was angry over the loud music the black teenager and his friends had been playing in their car. She later became a national spokeswoman for the group Everytown for Gun Safety. Getting any kind of weapons or ammunition ban signed into law will be difficult if not impossible in the next Congress. Republicans expanded their Senate majority Tuesday, and President Donald Trump remains a favored ally of the National Rifle Association. In his midterm campaign sweep, the president frequently delighted his boisterous rallies with promises to "protect the Second Amendment" while at times saying that Democrats "will take away your Second Amendment." 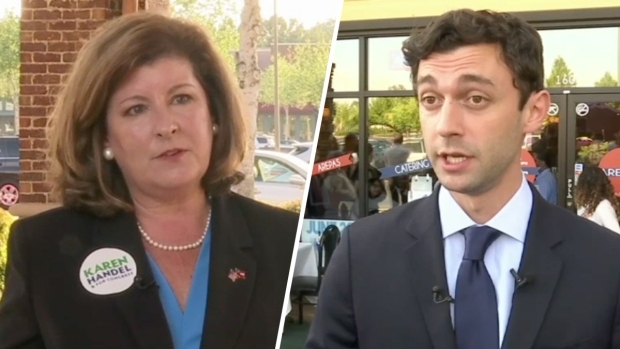 Democrat candidate Jon Ossoff hopes to win over a GOP-leaning 6th Congressional District in suburban Atlanta over Republican candidate Karen Handel in Tuesday's runoff election, a win that could rattle Washington ahead of the 2018 midterm elections. Woodall's campaign manager, Derick Corbett, said the campaign had no immediate comment Wednesday. "We know we're getting closer," said Bourdeaux's campaign spokesman, Jake Best. "But we don't know how much is left." Georgia law guarantees an election recount if a losing candidate requests it after finishing behind the winner by a vote margin of 1 percent or less. Because in-person votes are cast electronically in Georgia, with no auditable paper trail, a recount mostly consists of re-tabulating digital votes already stored on machines. Those results aren't likely to change. However, absentee votes and provisional votes — those cast by voters whose eligibility is challenged at the polls — are still cast on paper ballots in Georgia. Counting those a second time has produced minor changes in the vote total during prior elections. Woodall has represented suburban Atlanta's 7th District since 2011. The Republican won each of his prior elections with no less than 60 percent of the vote. Rather than distance himself from Trump, Woodall campaigned as an experienced lawmaker who could "get results from this president." Bourdeaux is a professor of public management and policy at Georgia State University in Atlanta and once worked at the state Capitol as director of Georgia's Senate Budget and Evaluation Office. She raised more than $1.9 million for the race as of Sept. 30, compared to Woodall's $1.02 million. Ralph Norman ran a fantastic race to win in the Great State of South Carolina's 5th District. We are all honored by your success tonight!